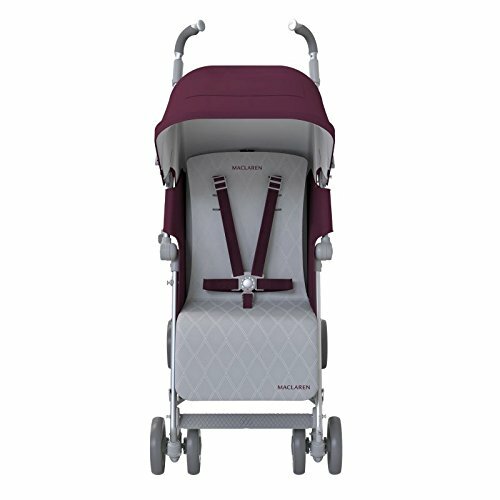 The Techno XLR is the crème de la crème in all the Maclaren series and one of the best appointed models in the umbrella stroller category. 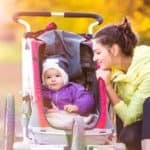 It is a favorite among first-time parents who want a stroller with luxury features and want something convenient and sturdy at the same time. 4 Tell me more about the seat. 6 How about steering & handling? What is the difference between Maclaren Techno XT and the Techno XLR? They are both very similar and basically the same stroller with only three differences between the them. The Techno XLR has a wider seat and a 65 pound weight limit, and the XLR weighs two more pounds than Techno XT. You also get a matching cozy winter boot – like a blanket enclosure – for your baby. As you read this, think about what you really need. All Maclaren models are similar but for a few extra features added on as you go up in price. Determine which features are worth paying extra for and which features you can live without. By the time you finish this review, you’ll have a solid understanding of what the Maclaren Techno XLR can offer you. First let’s start with all these wonderful features. Because of the extra heft in the XLR, the maximum weight your child can be to ride is an impressive 64 pounds; more than double than most umbrella strollers in its class and 10 pounds more than the other Maclaren models. The extra few pounds and wider seat allows even the biggest kids comfortably with a weight capacity of 65 pounds. Baby reclines in comfort with the 4-position recline feature. I absolutely love the recline because it’s done with a a one-handed lever; lay your baby back without disturbing him or her, then gently push the seat back upright just as easily. Do you have a little escape artist on your hands? Then you will love the padded 5-point harness. The heavy-duty buckle is no cheap piece of plastic; it is a serious piece of work that won’t break or wear out over time. And here’s a highlight: the buckle is childproof! To release the straps you must press on both the outside and inside of the circular buckle, and you have to press quite firmly. A seat extender supports baby’s legs so your little one can fully lay down. Simply pull out the individual extenders with your finger on either side of the seat. The seat liner is the same color as your stroller on one side and the other side has soft microfiber. Best of all, it is washable and adds extra padding to the seat for a super cushy ride. I like that it protects the seat, because you can always replace the liner with other patterns and designs whenever you wish. As a matter of fact, choose from dozens of different Maclaren reversible seat liners to change and customize your Techno XLR’s look. They’re a lot of fun! Now here’s one of the features that bumps this stroller up into the luxury category. The Maclaren Techno XLR comes with an additional quilted seat liner AND a removable head hugger support for your infant. In addition, for those cold winter months, you also receive a stylish matching winter boot – like a baby sleeping bag – to keep baby cozy on your outings. 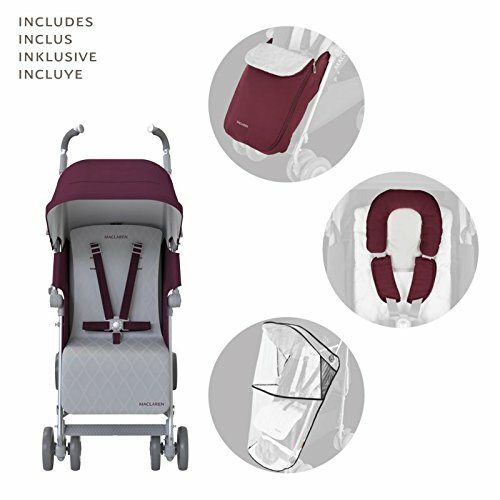 The sun canopy in all Maclaren strollers have had a huge improvement this year. While the XLR has had a sufficient canopy in the past, it’s even better now. A zip-away panel extends to reveal mesh side windows for air circulation. The front has a flip-out sun visor that provides extra coverage. With the hood completely down, like you see in the photo, it covers half your child! How about steering & handling? Parents rave about the durability of this stroller; the smooth ride on the 6 ½-inch hard plastic wheels and dime-turn maneuverability make the Maclaren Techno XLR a pleasure to take on long walks. The all-wheel suspension absorbs some of those bumps along your way. Lock the front wheels straight for grass or mulch at the park, however keep in mind that this stroller was made for smooth surfaces. The brakes are linked so that stepping on one pedal will engage the brakes over both rear wheels. Lift up the lever to disengage. How easy is that? When you are ready to fold your Techno XLR, make sure the canopy is pulled back and the storage basket is empty. While the Maclaren Techno XLR can be a little tricky to fold the first time, many moms say that after a few times doing it, folding became a snap. Like all Maclaren strollers, folding is a two-step process. Lift up on the red lever between the wheels, step down on the right side lever, then it folds forward and down nice and compact. 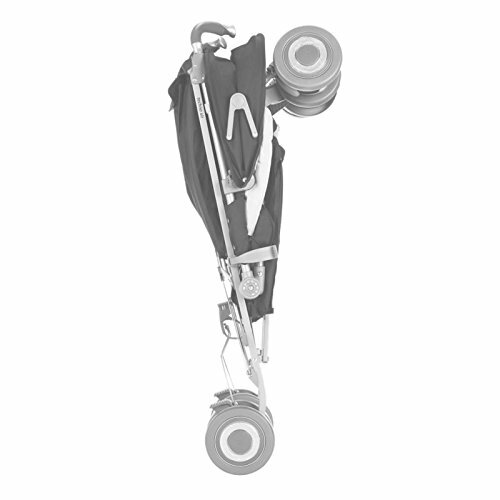 Once your stroller is folded down, an automatic latch holds your frame in place. Transport it with ease with a carrying handle on left side of the frame. Nice and neat! Seatback to Canopy:27″Wheel Size: 6½”Stroller weight: 17½ lbs. Tall parents love the ergonomically-shaped, height adjustable handles on the Maclaren Techno XLR. 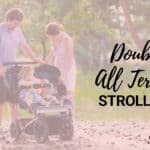 Mom and Dad don’t have to stoop down, as they do with other strollers the same size and they don’t kick the back of the stroller while walking. If you need additional height, the handles telescope up to give you an additional inch of length. From the ground, the height to the handle is 42-43 inches. 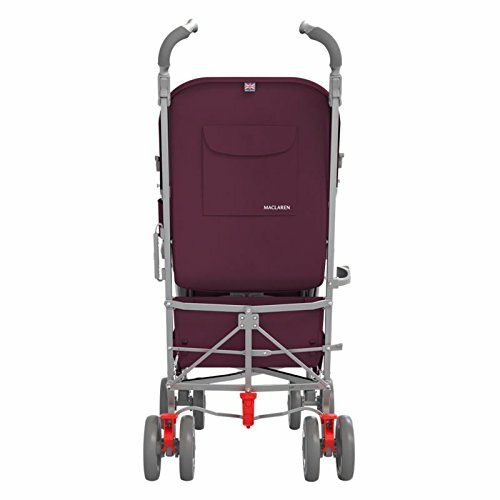 Umbrella strollers don’t have large storage baskets and the Maclaren Techno XLR is no exception. The basket underneath the seat is large enough to carry the extras you need to take with you on your outing, but you’re not going to fit a huge diaper bag and your purse in there. Do keep in mind that once the seat is fully reclined, you won’t have access to the storage basket, which is normal on this kind of stroller. More storage can be found on the back of the canopy: a mesh pocket and a pocket with a velcro closure. Just the right size for your keys and cell phone! A rain cover is included and can be kept in one of the storage pockets on the back of the canopy for your convenience. Many parents feel that they simply need a bit more storage space and so they add the Maclaren Universal Organizer to the back of the handles. This organizer has a pretty big net at the bottom to hold all kinds of toys or extra clothes, burp cloths, etc. The organizer has two cupholders as well, because we all want to have our drinks with us! Another alternative that has very good reviews is the J.L. Childress Cups ‘N Cargo Stroller Organizer it costs a bit less, but is rated better, so check that out before you decide. Another accessory parents like to get is for their trip. 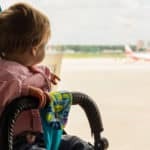 Say you need to gate-check your stroller at the airport. Why leave damaging it to chance? Normally a Maclaren travel bag is available, but not at the time of this review. In the meantime, buy the umbrella stroller gate check bag to ensure your investment arrives safely. This one is the most basic you can get for like $10. Spend a bit more for a padded travel bag that will last longer than a half-dozen flights or less. You don’t want your vacation ruined if your stroller arrives damaged. In case you missed it earlier, when I was telling you about the seat, you can get dozens of different Maclaren seat liners to give extra padding, protect the seat and give that splash of color that makes your Maclaren Techno XLR uniquely yours. These are just fabulous? Which one is your favorite? The Maclaren Techno XLR has gotten mixed reviews in the past, but the latest version is getting high ratings. The Techno XLR receives the most positive feedback for its light weight and how comfortable it is for taller parents. The recline feature is an obvious winner with this stroller and reviewers feel it is sufficient for napping babies. The seat extender is appreciated, too, as a necessary component for a full recline. This stroller is a popular choice for traveling families going to theme parks where they have to get in and out of shuttles often, and also for families taking an airplane and don’t want to gate-check their stroller. Urban-dwelling parents taking public transportation will also find the Maclaren Techno XLR a clear choice. 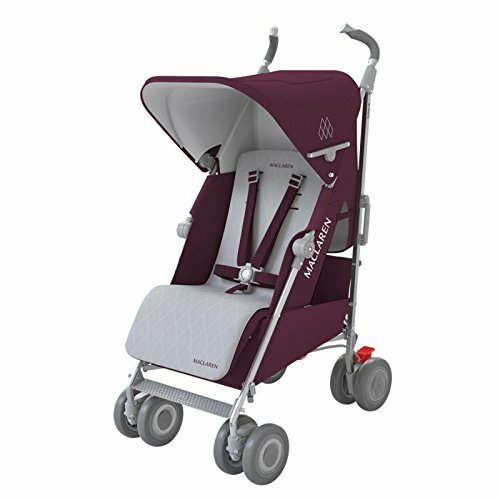 Parents have commented on the trendy and stylish color combinations and the contemporary style of the Maclaren Techno XLR. They also like the thick padding on the seat and feel their children are very comfortable. Some kids sleep for hours at a time in the XLR. Some petite mothers remarked that the handles on this stroller came up to their chest! So while this is a great stroller for average-height and tall parents, petite adults may find this stroller a challenge to push. Because this is the larger Maclaren models, there were some complaints of the size and heaviness of the Maclaren Techno XLR; some parents recommend the smaller Maclaren models. Having access to the storage basket when the seat is reclined is sometimes difficult. Imagine how excited you’ll feel when that box arrives at your door!